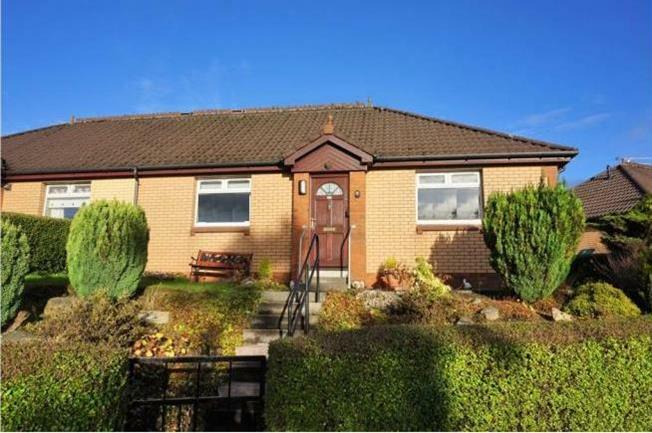 2 Bedroom Semi Detached Bungalow For Sale in Glasgow for Offers Over £110,000. Fantastic semi-detached Bungalow in this very popular location. The property is offered to the market in walk-in condition, as the current owners have spent a lot of time, effort and money creating this fantastic family home. The accommodation on offer extends to, a welcoming hallway, through a bright and spacious formal lounge leading, through again to the modern stylish Kitchen with quality floor and wall mounted units, also having a selection of integrated appliances, from the kitchen there is access to the private rear decked garden. The property further benefits from 2 double bedrooms both with storage, finishing the accommodation is a stunning bathroom featuring a three piece suit, spa bath with over bath shower. The property also benefits from gas central heating, double glazing and front and rear private gardens. Local amenities include public swimming pool and leisure centre, library, recreational park and much more. Shopping can be found at Asda Superstore at Robroyston and Tesco Superstore at St Rollox Retail Park. Public transport includes both bus and rail links to the city centre and surrounding areas which has a host of bars, restaurants, cinemas, theatres, universities and hospitals. Under the terms of the 1979 Estate Agents Act and our Code of Practice, we hereby give notice that the vendor of this property is a relative of an employee of the Countrywide Group of Estate Agents.